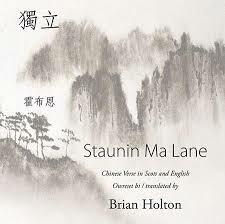 In Staunin Ma Lane, Holton has selected classical Chinese poems from the 11th century BC to the 14th century AD, some of them well-known to generations of Chinese schoolchildren, for improvisation and translation into Scots, with English “glosses”. Holton states in his useful Afterword: “if you expect to find dictionary definitions of Chinese words in my translations, you will be disappointed. That sort of drably mechanical ‘accuracy’ does not make poetry, and a poem that doesn’t move the reader is like a joke that isn’t funny”. Rather, Holton conveys the energy and feeling of the original, retaining some allusions to Chinese history, culture and landscape but also borrowing from Gaelic refrains and Border Ballads, from Robert Burns and Gawain Douglas. Orioles become yellowhammers; mulberries are rowans; Paradise is Tir na nÓg. Holton’s translations of poems attributed to Qu Yuan, the first named poet in recorded Chinese history, are particular gems, especially given the complexity of the language of 2500 years ago and the richness of imagery and symbolism (much of it associated with ancient myths and shamanistic rituals). The glorious sounds and images in these poems are perfectly conveyed in Holton’s translations, fizzing with the dazzling splendour of gold and jade, swords and crowns, flowers and spices (“mappiemou mait, ay, an mats o the mascorn/pour the cannel yill, see, the pepperie brose”). A sensual and emotional feast! an forgot aa else yince it wis sung. and forgot all else once I’d sung it. Even without any knowledge of Chinese, the formality of the original poems is apparent on the page. Often they are exact quadrants, with repeated characters, and therefore repeated sounds, towards the end of lines, reminiscent of the containing, constraining properties of sonnets. Chinese logograms lend themselves to this regularity of shape in ways which the phonemic alphabet of Scots and English does not but Holton manages to convey the importance and formality of shape, nonetheless, by centring his Scots and English versions and by imitating and exploding the shapes of the originals as closely as he can. woo me nou, for A winna stay! The archaisms of the classical Chinese language, the multiple meanings of individual Chinese characters, as well as the very different cultural allusions must surely have made translation a daunting task. But if so, it never shows. There’s a natural ease to Holton’s Scots which belies the compromises which translation necessarily incurs when qualities of sight and sound, meaning and allusion jostle for survival in each line. Holton’s improvisations, translations and cover versions – faithful and playful, confident and experimental – make classical Chinese poetry both highly accessible and hugely enjoyable. This is a beautiful book including the poems! I would recommend it to anyone who loves and appreciates poetry. “Staunin Ma Lane” is in my opinion already a classic and will continue to delight many, for years to come. Well done and I very much look forward to and hope there will be more translations and owersettins from Brian Holten.